Falafel burger recipe made with home made falafel patty from scratch. Served with hummus, Israeli salad and a creamy mayo. With step by step pictures. I love burgers. I get a burger craving every now and then. The messy dripping, juicy patties, I love it all. 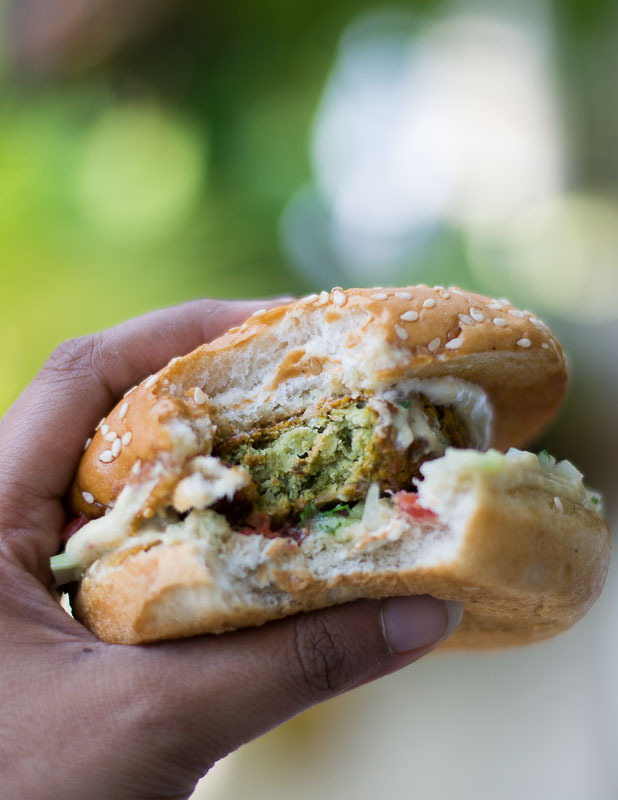 This home made falafel burger is dynamite. 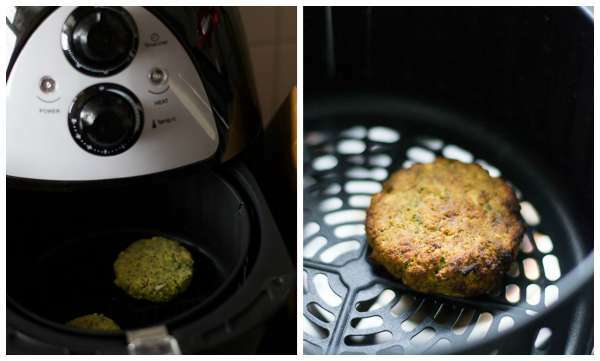 The falafel patties are air fried using an air fryer and that makes it even healthier too. If you do not have an air fryer, you can shallow fry the patties in oil. The patty is so meaty and really really flavorful. Lets ride into flavor town! You can find the deep fried Falafel recipe here. Dump the chickpeas in a large bowl and add 1/2 teaspoon baking soda. Add water till it fills the bowl and let it sit at room temperature overnight for 8-10 hours. The next day, drain. 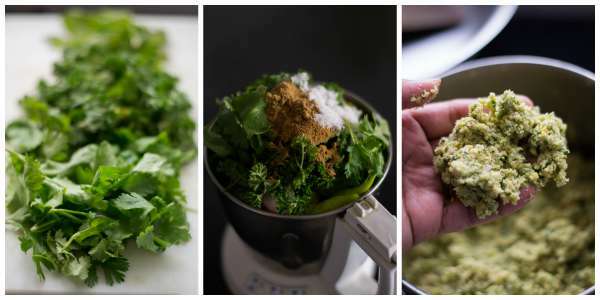 Chop the greens ( I use coriander leaves, mint leaves and parsley) roughly. Set aside. Add in the rest of the ingredients along with the greens. Basically dump all the ingredients in your mixer. Work in batches if necessary. You need to grind the mixture to a slightly coarse paste. Do not add any water while grinding. For every pulse in your mixer, open the jar and slightly mix everything so the mixture gets ground evenly. Resist your urge to add water. Once you feel that the mixture has become a coarse paste, Set aside. The coarse texture is important for this recipe. Make a 3-4 inch patties out of the mixture and place it in the air fryer. Set the timer for 15 minutes and fry the patties at 200 degrees Celsius temperature. Fry in batches. Do not over crowd the air fryer. Set aside. You know what? We did not use even a smidgen of oil for frying the patties. Isn’t that great. The patties turn out crispy and crunchy and go so well inside the burgers. You can shallow fry the patties if you do not have an air fryer. 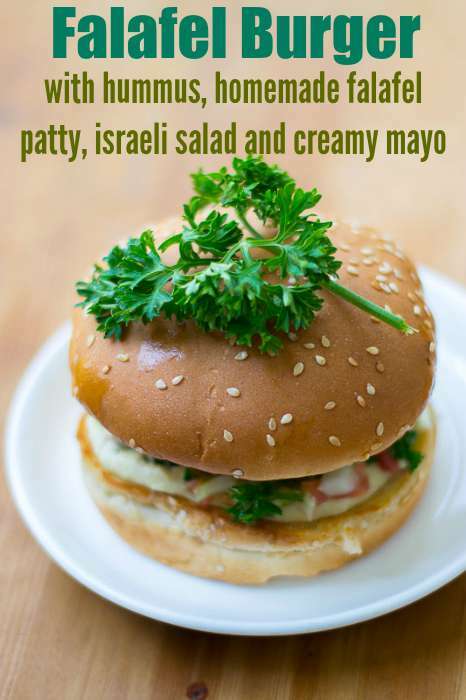 Now lets make a simple Israeli salad for the burgers. 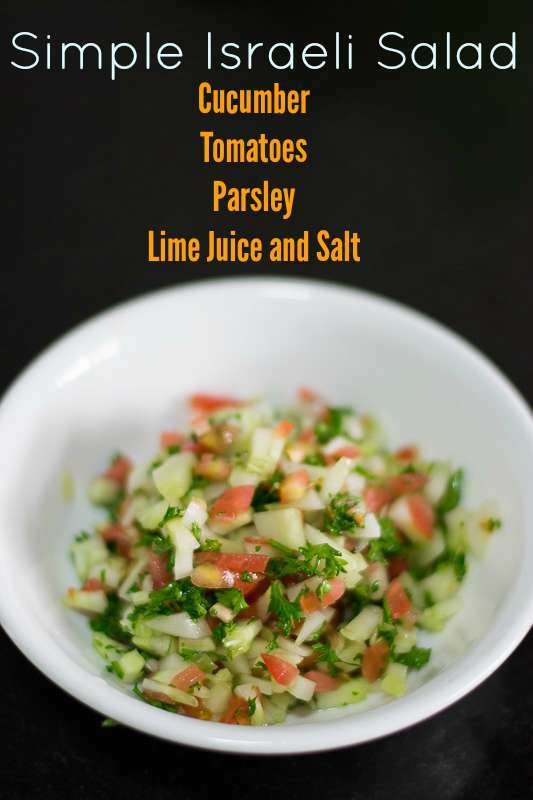 Mix all the finely chopped ingredients listed under Israeli salad and set aside. # Toast the burger buns on each side with a little butter. 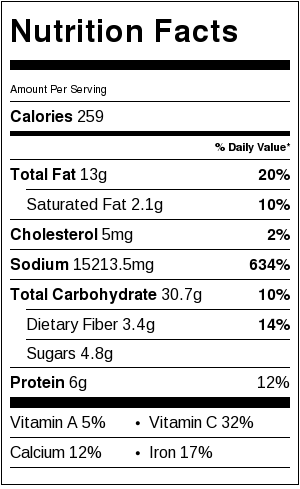 # Spread a tablespoon of Hummus. Falafel burger recipe made with home made falafel patty from scratch. Served with hummus, Israeli salad and a creamy mayo. 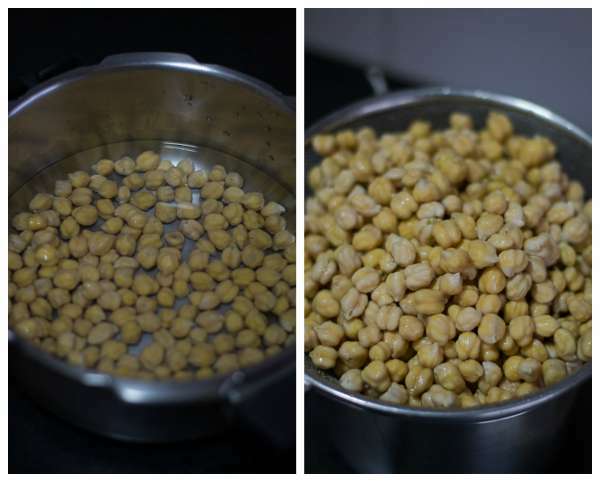 Dump the chickpeas in a large bowl and add ½ teaspoon baking soda. Add water till it fills the bowl and let it sit at room temperature overnight for 8-10 hours. The next day, drain. Make a 3-4 inch patties out of the mixture and place it in the air fryer. Set the timer for 15 minutes and fry the patties at 200 degrees Celsius temperature. Fry in batches. Do not over crowd the air fryer. Set aside. Your Zero Oil Patties are ready. Mix all the finely chopped ingredients listed under Israeli salad and set aside. Can the falafel patty be prepared and stored in the freezer before frying ? Sure Priya. You can. Completely thaw*** before frying. This turned out great ! Thank you for the simple recipe. I and TH went shopping for the Chana and Extra Virgin Olive Oil just to prepare this and consume ! That’s the madness we were driven to !! Thank you so much Sneha. It means a lot to me. Happy Cooking.